It’s no secret that the emergence of electronic medical records (EMR) has forever changed the way physicians document and access patient information. But just how much have these systems changed medical documentation? We interviewed Dr. Sana L. B., a neurologist with almost 40 years of experience to learn his thoughts on the evolution of EHR and how it has changed his role as a physician. For a physician with nearly 38 years of private practice experience, the evolution of medical dictation is clear. From paper to electronic, we asked Dr. Sana B. how his role in the medical practice has changed since the introduction of EHR. “As the EHR was introduced, it became more and more difficult to practice,” Dr. Sana B. said. EHRs, regardless of their interoperability and accessibility benefits, seem to take the personalization out of documentation. Because of the required fields needed to create such intricate data, physicians are no longer able to personalize notes in such a way that helps them–as well as patients and fellow physicians–understand their intent. From works of art to cookie-cutter computerized data, there’s no doubt that EHRs have changed medical documentation. What’s changing even more, though, is the amount of IT and data requirements that come along with them. Technology across all industries has grown tremendously over the past decade. And while the advancement of technology in medicine has provided some amazing benefits, it has also created some serious gaps. Take EHRs for example. We’ve already learned that EHRs have taken away physicians’ abilities to personalize their data. But what else is it affecting? Dr. Sana B. gives us an insider’s opinion on some of the technical issues that come with EHR. Unlike paper records, the retrieval of electronic medical records is completely dependent on the functionality of the system. Therefore, if there is a technical issue with the system it becomes a huge issue in documentation and access to records. A large practice with an in-house IT team has the advantage of working through those errors quickly, while a smaller practice without those resources might not. Dr. Sana B. mentions what he calls “very weak points” in the EHR system in regards to its effect on the patient-provider relationship. Because of the complexity of the system and the amount of time it takes to fill out the system’s forms, the amount of time a physician spends charting the information is much higher (in comparison to paper charting). Because of this, physicians are forced to focus most of their time on ensuring their notes are accurate, instead of focusing more on what’s most important–the patient. Not only does the physician’s lack of time affect the patient experience during the visit, but it also interferes with scheduling. Typically, a physician will spend several hours going through their EHR and editing or adding any necessary information. With all of this time spent in the EHR, physicians are having to push their appointment dates out for months and months, leaving even more time between them and their patients. So what can be done to fix these issues? 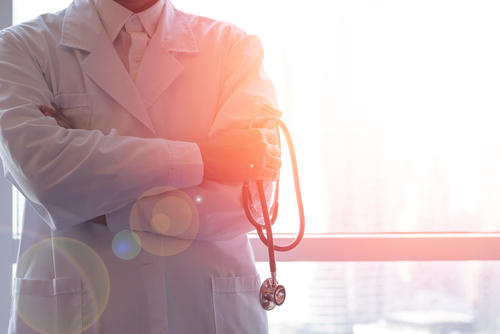 Since EHRs certainly won’t be going away–and because we can’t deny the benefits the that EHRs do provide to healthcare–there must be a solution for physicians and their practices. According to Dr. Sana B., the trick to remaining productive and precise as a physician is by hiring a medical transcription company to assist with dictation. Medical transcription services allow the physician to speak into an electronic device linked to a skilled medical transcriptionist who types each word into a document or directly into the EHR system. The physician can then review the document, sign it and authorize it as an accurate chart record. At DataMatrix Medical, we provide accurate medical transcription solutions that easily integrate with your current workflow. Having worked with DataMatrix Medical for nearly eight years, Dr. Sana B. gave us some expert feedback on our services and their effects on his practice. Is my EHR slowing me down? Is EHR interfering with my relationship with my patients? Am I struggling to produce accurate records in a timely manner? If you answered yes to any of these questions, it may be time to consider medical transcription for your practice. Visit our website to learn more about our medical transcription services. Want to optimize clinical productivity through outsourcing? Download our free guide below!